This is my eighth year as a secondary English teacher. I teach a full timetable of lessons and it would be a fair estimate to say that I spend, on average, an hour a day marking… or in other words over 8 full days an academic year bent over a never-ending pile of biro-scrawled offerings. At the beginning of this year, I decided to take a step back. What is time well spent and what, quite frankly, is a waste of time? Could I realistically cut down the marking hours, yet continue to have a positive impact on my students? Or even better: could I claw back precious time, yet have an even greater impact on student progress than I once did. Minimum effort for maximum pleasure, you might say. 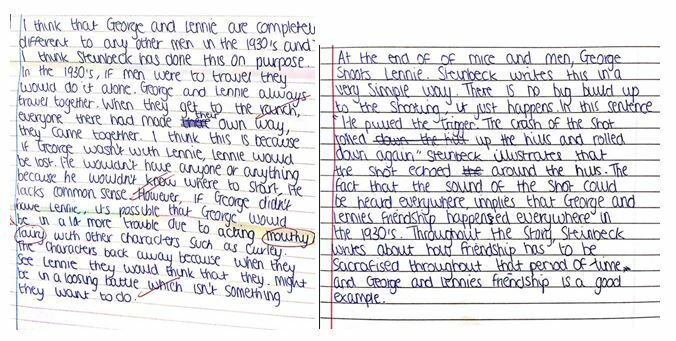 I had been marking a class set of Y10 essays on John Steinbeck’s Depression-era novella Of Mice and Men. Instead of writing out comments slowly – and slowly it must be; my handwriting is pitifully awful – over and over again, I scribbled praise comments and targets on a piece of paper. In their books I used symbols in their place. If, for instance, a student had shown analysis of language at B-standard, I would write **%; if they also needed to improve the way they made links to the novel’s context, I would write T4. Each time another student required similar praise comments or targets, the symbol could be repeated. Stars for ‘good’, ‘very good’ and ‘excellent’; symbols for the criterion successfully hit. As new praise comments and targets became necessary, new symbols were produced and quickly added to the handwritten list. When the work was handed back, students copied them from the PowerPoint slide I had quickly produced. Simple. Lesson time is not wasted deciphering my handwriting – Sir, does this say ‘elephant’? Praise is much more focussed on assessment criteria than it once was. I win back in the region of one minute per student, or, let’s say, an hour a week. It can be used again – modifications necessary of course – next time round. It is also a useful tool for guiding future peer- and self-assessment. So where next? 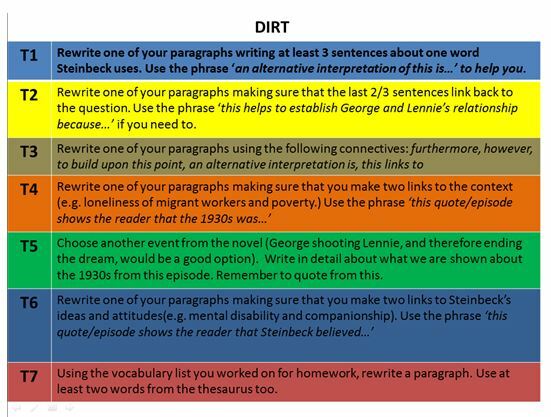 There has been a lot of buzz on twitter lately about DIRT (Directed Improvement and Reflection Time). Too often in the past, I have assiduously set targets, yet left it at that. Right, kids, there’s your Of Mice and Men target – now we’re doing Shakespeare. Without time to act upon them, targets are left to rot… and rot they do. The left hand piece was his original paragraph; the right hand his improved one. He has hit his target – improving his expression through better vocabulary choices – yet only superficially so. The link between the quotation and the 1930s context is woolly to say the least in the second as well as the first paragraph. There is still not sufficient explanation as to why the phrase ‘one behind the other’ demonstrates that they were ‘very close friends’ or ‘had a strong companionship’. Something else was needed. Yet, in other circumstances it worked well. This student was asked to write a completely new paragraph (on the right hand side) in response to part b of the question. Her second attempt is a significant improvement on her first, if, albeit, a paragraph with a very different focus. On reflection, it seems to me that the first student was in fact completing a reflective task, rather than an improvement task. By asking him to rewrite a failed paragraph, he was always going to be restricted by the limitations of his first attempt – trapped forever, you might say, in its clunky assumptions. The second student had more of a chance to improve because, quite simply, she had been given a task that genuinely gave her the freedom to do so. Students begin by reflecting on their original piece by correcting SPG errors, improving vocabulary and responding to any questions I have written in their books (writing these could also be streamlined with a symbols approach). They will then complete a written task, free from the shackles of their original offering, with the aim of improving their work by focussing on one target I have set and one target they have chosen from the list. 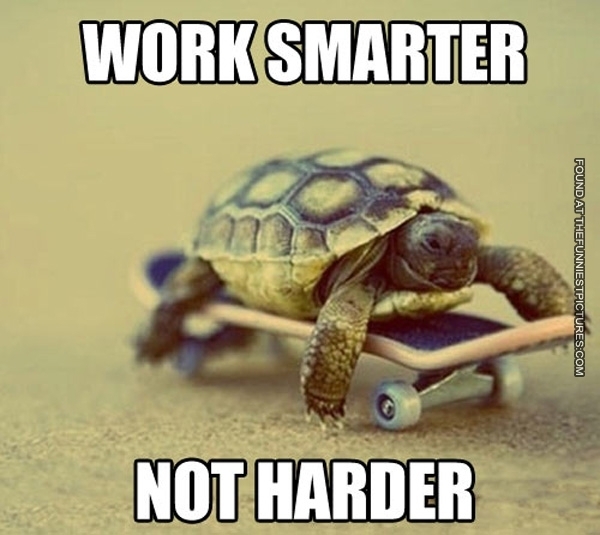 And this is precisely what time-saving strategies are about. They release us from our – too often – self-imposed prison cells to allow us the thinking space to become truly reflective. Mimimum effort really can lead to maximum pleasure; our students can only benefit as a result. This entry was posted in 15 Minute Forums and tagged Feedback, marking. Bookmark the permalink. The Y10s are set 2, which is around C/B. The idea with this group is to push as many towards A as possible. As much as possible I cross-reference with higher grade criteria, but I find the AQA English Lit assessment criteria almost impossible to decipher. 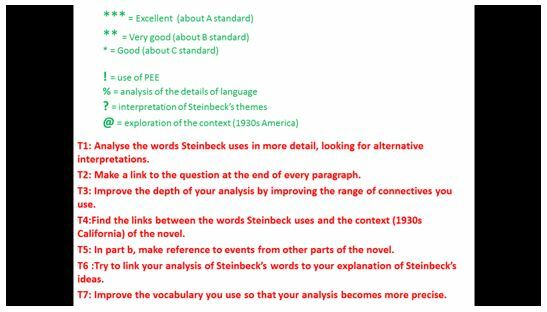 I try to make sure I provide a model paragraph at A/A* level – either written by myself or a student. Let me know how it goes. You can follow me at @atharby on twitter. This approach is really interesting. I think the ethos of teachers doing less, better, is very valuable. I teach Religious Studies and so have lots of KS3 classes and so workload is an issue. I am speaking about this topic at TLAB16 next month. Would you be happy for me to cite your blog post (with all the proper crediting) in my talk? Acting Deputy Head at Berkhamsted School.